The first time I saw this, I think my eyes almost popped out of my head. Then I realized that I was looking at the cover for Reform School Girls instead. 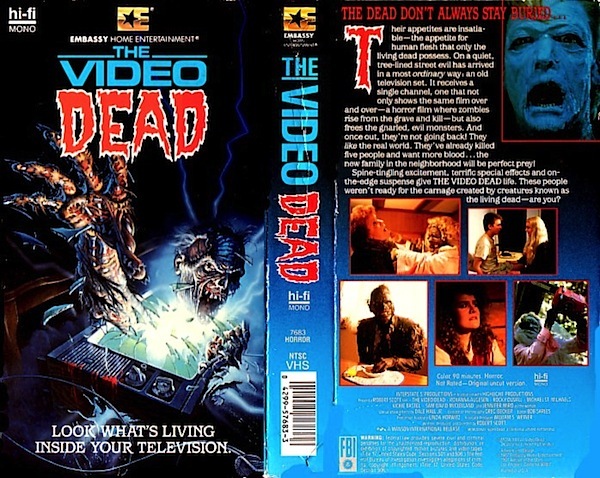 Nevertheless, the VHS packaging for The Video Dead remains a highlight as far as VHS packaging goes. The question is, was it better than the actual movie? Well – yes and no. The premise for The Video Dead is both simple and stupid at the same time. I don’t think this movie was made to make anyone use a giant amount of brain cells though, so stupid works in this case. Basically, a TV is delivered to a house in the woods that randomly spouts out a variety of zombies for no apparent reason. And that’s the gist of it. Probably more so classified as a horror/comedy, The Video Dead is the definition of a guilty pleasure. Aside from being viewed on VHS, it had a strong following on the USA Network’s, Up All Night and Saturday Nightmares weekly shows. As far as whether or not the VHS cover is better than the actual movie, I would begrudgingly have to say yes. The artwork is honestly stellar, especially for an independent film with a budget of $80,000. And had it not been for that artwork, I wouldn’t have even thought of picking it up to rent. Mission accomplished there. 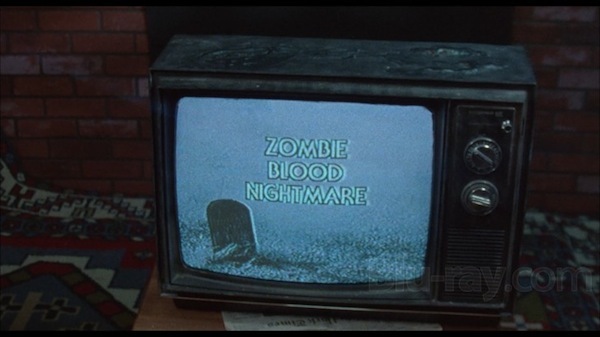 Let it be known though, I do have a soft spot for The Video Dead as an actual movie. It’s just that if you mention the name to me, I automatically think of the cover, not of the scene where a zombie bride somehow hides her entire body in a washing machine before strangling a lady. What kind of zombie strangles someone btw? If you have seen The Video Dead, you might find the zombie dinner table scene very reminiscent of Peter Jackson’s in 1992’s Dead Alive (a.k.a. Braindead). Is Mr. Jackson a closet fan of the movie? Perhaps. If you haven’t seen the movie though, Scream Factory recently released a double-feature Blu-ray version with TerrorVision being the companion film. And the good news is that they kept the original cover art for their release! Which makes me happy and makes writing this post all the more worth it.